The Philadelphia Bradley, a shoe from P's & Q's that's designed after the Philadelphia Cream Cheese brand. You can now buy sneakers meant to pay homage to a famous food associated with Philadelphia — even though that food has little to do with the city. P’s and Q’s, a local clothing store with a location on South Street, released The Philadelphia Bradley on Saturday as part of the shop's five-year anniversary. 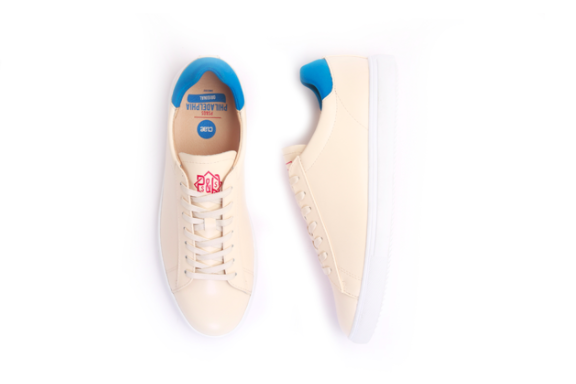 The store used a model from footwear brand Clae for the shoe, according to FootWearNews. In 1880, when New York cheese broker Alvah Reynolds pitched New York dairyman William Lawrence on creating better branding for his new product — which was richer, creamier and fresher than the more common Neufchatel cheese — Philly was widely considered the country’s top spot for high-quality dairy. Thanks to location dissonance, myths about the brand abound. “It was invented by someone in Philly and then stolen,” or “It’s actually from Philadelphia, N.Y. (Pop. 1,947),” read histories in various reputable cookbooks and culinary magazines. Only recently has the real origin story of what is now a $500 million-plus brand sold by Kraft Foods come to light. As BillyPenn notes, once Lawrence rebranded the product as Philadelphia Cream Cheese, it sold incredibly well, even though they were producing the now-famous bagel spread in upstate New York. So, Philadelphia's name was used to deceptively market cream cheese, and now said cream cheese is being used to sell sneakers. Everything is cyclic. Anyway, the sneakers are being sold for $140 a pair, but if you want them, you should act fast. P’s and Q’s said only 50 total pairs were made.